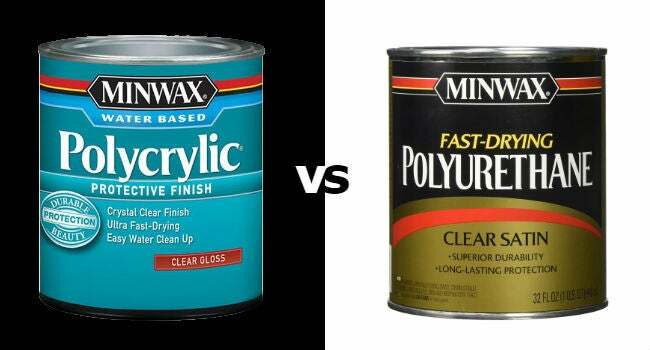 Don’t let their similar names fool you—polycrylic and polyurethane are not one and the same. Here, read up on the pros and cons of these two popular wood finishes so that you always grab the right one for your project. It’s hard to beat the natural beauty of wood; it has a depth, glow, and interest that few manmade materials can match. But left unsealed, wood is prone to damage from moisture, heat, and heavy usage. 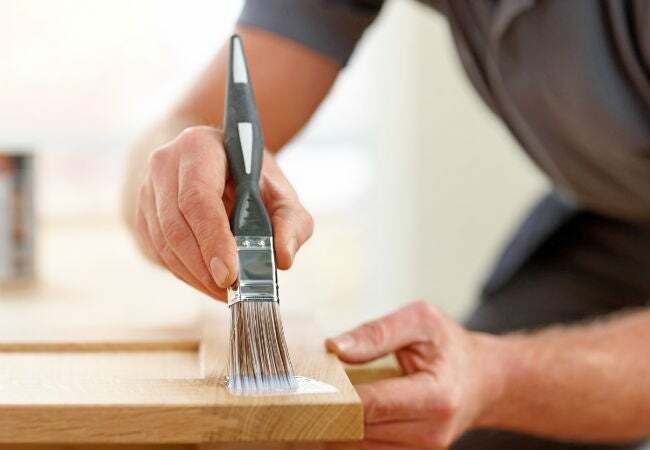 To prevent that, most woodworking projects—from newly refinished flooring to hand-crafted benches—end with a protective top coat, no matter whether the wood is raw, painted, or stained. Two such wood sealers popular with professional woodworkers are polycrylic and polyurethane. But their similar names, purposes, and application can confuse many novice do-it-yourselfers who head to the hardware store and see them side by side, sometimes even produced by the same manufacturer. Which—if either—of the two is best for sealing furniture? Will either affect the wood’s color? And which is easier to apply? We’ve outlined the biggest differences between the two wood finishes below and other relevant considerations to help you make a quick, easy decision on polycrylic vs. polyurethane without slowing down your project. Polyurethane lets you choose between an oil and a water base; polycrylic doesn’t. Yes, it’s not quite as cut and dry as oil- vs. water-based sealers. In fact, DIYers have even more options: Consumers will actually find both water-based and oil-based varieties of polyurethane on the home improvement center shelves, in addition to the strictly water-based polycrylic sealers. Oil-based polyurethane is very durable, making it the best choice for finishing wooden floors or furniture that gets a lot of use, such as a kitchen table. And oil-based polyurethane handles high heat like a champ—something that water-based polyurethane and polycrylic both struggle with. It’s also more tolerant of water, making it the best choice for outdoor furniture or other wooden objects likely to encounter moisture. Water-based polyurethane contains less odorous volatile organic compounds (VOCs) than its oil-based counterpart, so less hard on your lungs and your nose. It dries faster, as well. However, it’s not as resistant to high temperatures or water. Polycrylic is a water-based product that is far less smelly and toxic than either type of polyurethane, making it easier to work with. It dries very quickly, although it can take a long time to fully cure for use. (Rest things on a surface covered with polycrylic before it’s done curing, and you could actually scratch or indent the clear coat!) It doesn’t tolerate high heat as well as oil-based polyurethane, however. You’ll get a choice of sheens with both polyurethane and polycrylic, but polyurethane will also tint. Both polyurethane and polycrylic come in satin, gloss, and high-gloss sheens, so you can go as shiny as you’d like to emphasize your wood’s character and craftsmanship. However, oil-based polyurethane tends to dry with a slight yellowish tint, meaning you should only use it over wood that’s dark enough or warm enough to hide the yellow cast. Meanwhile, water-based polyurethane dries completely clear, so you can use it over light woods like maple without concern for yellowing. Polycrylic is generally said to dry clear, too, but as long as you’re careful with your application; it can take on a milky appearance if applied heavily over dark wood or paint. Though they’re all very strong, oil-based polyurethane is the most durable. 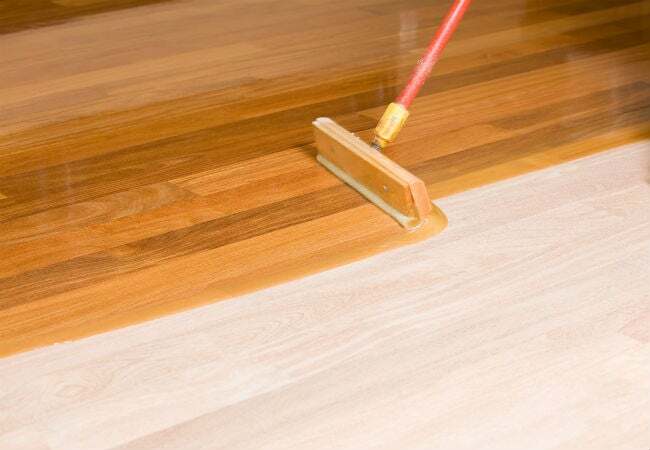 Whether you use polyurethane or polycrylic, you’re sure to get a durable, hard finish that will protect your wooden furniture or floor from mild-to-moderate abuse. But if you really need a sealer that can handle stronger stuff—such as daily, vigorous use or lots of foot traffic—oil-based polyurethane is your best bet. And if your finished piece will be exposed to high temperatures or moisture on a regular basis, oil-based polyurethane is definitely superior. It’s more difficult to apply polycrylic evenly than polyurethane. You have the choice to spray or brush on polyurethane and polycrylic. However, beware the challenge that comes with polycrylic’s runnier consistency; you’ll need to apply thin coats and keep an eye out for drips, then wait the recommended dry time so that you don’t end up with a sticky finish. Plus, because polycrylic dries very quickly to the touch, it’s harder to get an even finish over a large surface area. While both polyurethane and polycrylic can be applied over water-based or oil-based paints and finishes, you may find that polycrylic doesn’t dry quickly over matte latex paint due to additives in the paint. Polycrylic is far less dangerous and toxic. Polyurethane is very flammable while wet, so it requires careful storage to prevent a fire. As mentioned earlier, it also has a high VOC count that can irritate your lungs, meaning you’ll need to wear respiratory protection while applying it (although water-based polyurethane is far less potent than the oil-based version). Polycrylic, by contrast, does not have a strong odor and is not nearly as toxic as polyurethane, so you won’t need to don protective gear to apply it. Always consider your specific project when choosing your sealer. • Will the wooden piece be exposed to high temperatures or moisture? Then oil-based polyurethane is your best bet. • Are you applying sealer to light wood such as maple, or over wood painted white or another light color? Avoid oil-based polyurethane, which can dry with a yellow tint. • Are you sealing a wooden floor? Oil-based polyurethane provides the most durable finish in high-use situations like flooring. • Do you need a product that dries quickly? Polycrylic dries much faster than polyurethane does. • Are you working indoors without good ventilation? You’ll want to use polycrylic, which is less toxic than polyurethane, especially when working in a poorly ventilated area. • Are you sealing a large piece of furniture? Because polycrylic dries very quickly, achieving a smooth finish over a large area can be difficult. • Are you sealing a vertical surface, such as the sides of a bookcase? Polyurethane is easier to work with on an upright surface, as it is thicker than polycrylic and less prone to dripping. • Do you want the easiest cleanup? Polycrylic is the winner, here, as you need only soap and water to remove it from your hands, brushes, and other surfaces where it might spill during application. • Is budget a big concern? Polycrylic is generally less expensive than polyurethane.